For day two of the cosi tour I am happy to have Marta from Do Guincho and Jane from Buzzmills sharing their suits. Jane blogs from Buzzmills in America and sews for her two children. Jane helped me with testing out my pattern. You can see her first cosi she made for her daughter Violet here. 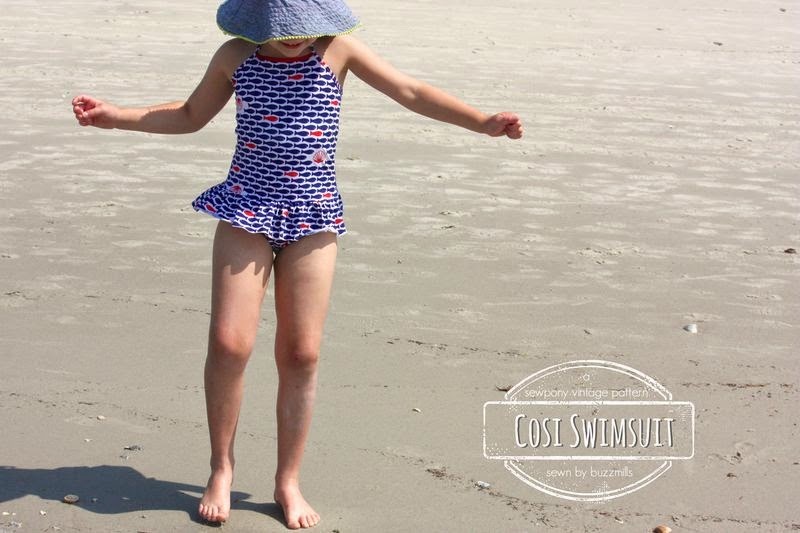 for her second cosi, she sewed up view D in a sweet Girl Charlee swimsuit fabric. I love the fish! Head over to Buzzmills to see more! Marta blogs from Do Guincho in Portugal and sews for two sweet girls - Teresa and Ines. She sews the sweetest things for her daughters and I am excited to see more of Teresa's cosi after Marta sent me this sneak peek...She added beads to the strap ends - such a great detail! Head over to Marta's blog to see more! Thank you so much Marta and Jane!! Your suits are gorgeous!! You can buy my pattern here. You can use the code: COSITOUR15 to receive %15 off at checkout. This applies to all of my patterns until next Friday 18th July. Please come back tomorrow to see what Olga and Stacey have made! Thank you so much Suz for the opportunity to sew such a great pattern! thanks for inviting me along on the tour! you've created such a great pattern that I'll be using for years to come!